Compensation: $50,000 - $55,000 annually depending on skills and experience. Competitive benefits package; including the potential for health insurance, HSA, Simple IRA, paid holidays, and paid time off. Urban Boatbuilders is seeking an individual who is passionate about youth empowerment and hands-on learning. Reporting to the executive director, the program director is responsible for the success and growth of Urban Boatbuilders programs, including the partnership program and the apprenticeship program. The Program Director is responsible for program planning, delivery, and growth; staff management and development; and quality control and evaluation. The program director is responsible for maintaining positive and productive relationships with current and prospective program partners and for promoting awareness of and advancing Urban Boatbuilders mission, strategy, programs, services, and impact. Excellent organizational, collaboration, and communications skills. The ability to lift and/or move up to 50 lbs. Application deadline is Thursday, April 18th. Please email your cover letter and resume to Marc Hosmer, Executive Director, at hr@urbanboatbuilders.org. The Youth Development Boatbuilding Instructor facilitates and manages building classes with small groups of middle and high school aged youth in diverse settings. The position is focused on creating a safe work environment, managing boat building projects, fostering a positive team culture, and teaching technical skills. Successful applicants will be able to demonstrate a commitment to engaging young people through project-based learning and building positive relationships with youth and community members. The instructor will deliver programming at sites across the Twin Cities area and/or at the Urban Boatbuilders shop. Days, hours, and location are project specific and vary depending on the needs of the partnering organization. Class Description:This class will facilitate team building and target physical science standards through thebuilding of 2 15’ Canoes. The 2 instructors will co teach 16 students at a time and will have one teacher from the partnering organization supporting in the classroom. We believe that diverse perspectives and backgrounds create a rich work environment that enhances our ability to pursue our mission and support youth. We are committed to building an organization that fosters inclusivity and equity among members of the community. Our organization actively seeks a diverse pool of candidates for all positions. 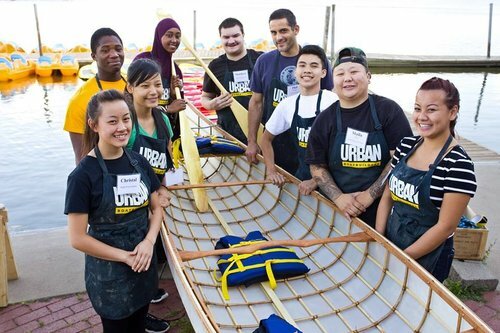 Urban Boatbuilders is a youth development organization and our mission is “to empower youth to build the skills they need to succeed in school, work, and life through the building and use of wooden boats.” We serve hundreds of youth each year. Through our Partnership Program and Apprenticeship Program, youth develop technical woodworking skills, social and emotional learning skills and a connection to their local waterways.